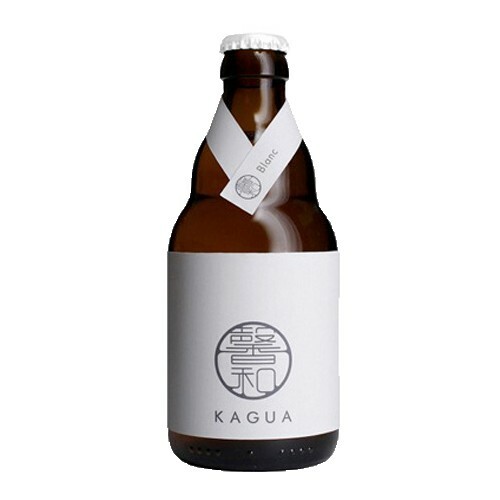 Imagine a mix between a Belgian wit and a full-bodied Belgian blonde ale, and you've got Kagua Blanc. The first thing you'll notice is the nose and the Japanese yuzu fruit that gives it its beautiful citrus nose. It pours out with a full, creamy head like a wit, but the flavor takes on a much deeper profile, showing off the malt, especially the wheat, and its Belgian spiciness. Kagua beers are designed to be paired with the finest foods, so make your favorite dish, pour some Kagua into your favorite wine glass and enjoy the night.